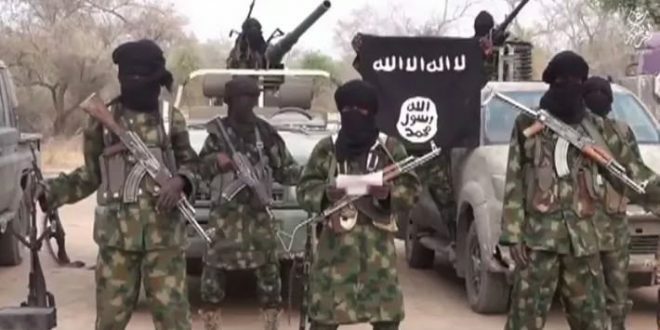 The Islamic State in West Africa (ISWA), a faction of Boko Haram sect, attacked Gudumbali, Guzamala local government area of Borno state on Tuesday. It is the second time in three months that the village will come under attack. The Boko haram insurgents attacked the village at about 7 pm and engaged in a gun battle with the troops stationed in the area. It was gathered that hundreds of residents of the area had to flee into bushes for safety as the exchange of gunshots reportedly lasted for hours. Last month, Boko Haram insurgents launched attacks on villages and military formations in Borno and Yobe states leading to lots of casualties and destruction of property. In the attack, boko haram insurgents claimed to have attacked soldiers stationed in Arge, an area close to Lake Chad killing seven soldiers and injuring 10. While the military said it was intensifying efforts to end the attacks, a military source said “things would be under control.” “I am sure the troops there would repel the attack”. This is coming few days after the Shehu of Borno, HRH, Alhaji Abubakar El kanemi said, “the people of Borno are still under the insurgents’ siege”. .
“Nobody can dare move out of Maiduguri within 10 kilometres without being confronted and attacked by Boko Haram,” he had said. “Quite a number of farmers are being killed and kidnapped on a daily basis around Molai General Area, which is just 10 kilometres away from the metropolis, along Maiduguri -Damboa -Biu road”, as reported by some media.